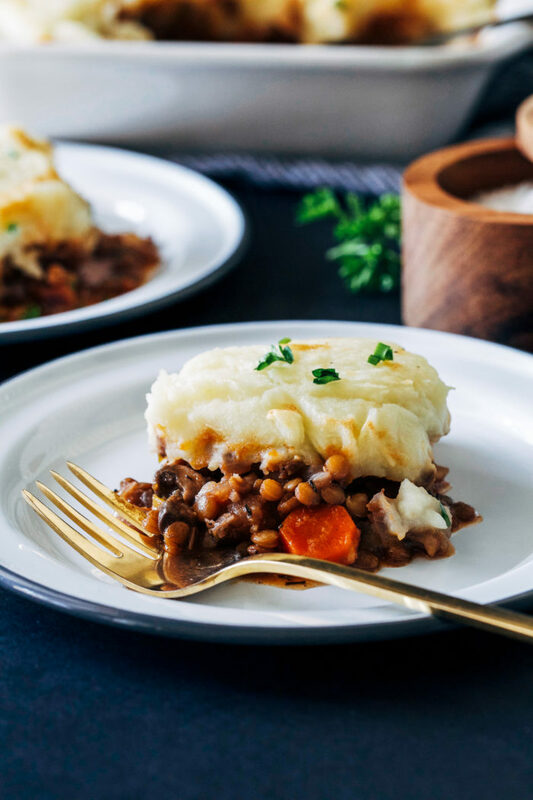 Vegan Lentil Shepherds Pie- a plant-based take on the comforting classic made with hearty lentils and parsnip mashed potatoes. So delicious that even meat eaters will love it! 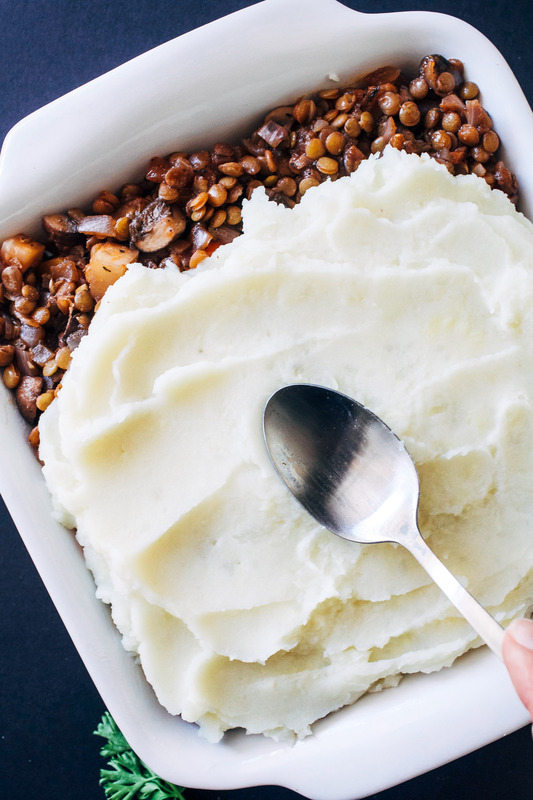 Is there anything more cozy than Shepherds Pie? This vegan version made with lentils is based off a recipe we had years ago from a vegetarian wine bar in Oakland called Encuentro. Sadly they decided to shut down their brick and mortar restaurant shortly after we moved back east. I guess the only positive is that it did make the move slightly less painful knowing we weren’t leaving that restaurant behind. The topping was made with classic creamy mashed potatoes but they were enhanced by the addition of mashed parsnips. It’s amazing how adding something as simple as parsnips can kick the flavor up about 10 notches. If for some reason you can’t find celeriac or parsnips, no worries, the recipe can still be made without them. As much as I love them both in this dish, it’s still plenty tasty enough sans celeriac and parsnips. Prep the topping: the potatoes and parsnips are boiled in water for about 30 minutes, until soft. Then we drain them, mash them together with dairy-free butter, milk and salt. Make the filling: while the potatoes and parsnips are boiling, we start the filling by cooking the vegetables with seasonings until soft. Then we pour in the red wine, tomato paste, and worcestershire, lentils and broth and cook until the lentils are tender, about 20 to 30 minutes. Dish it up: once we have the filling and the topping prepared, we’ll layer them in a casserole dish and bake until the potato topping gets light golden brown on the edges. Serve warm and enjoy! Be prepared to savor every bite because it’s gonna be SUH GOOD. 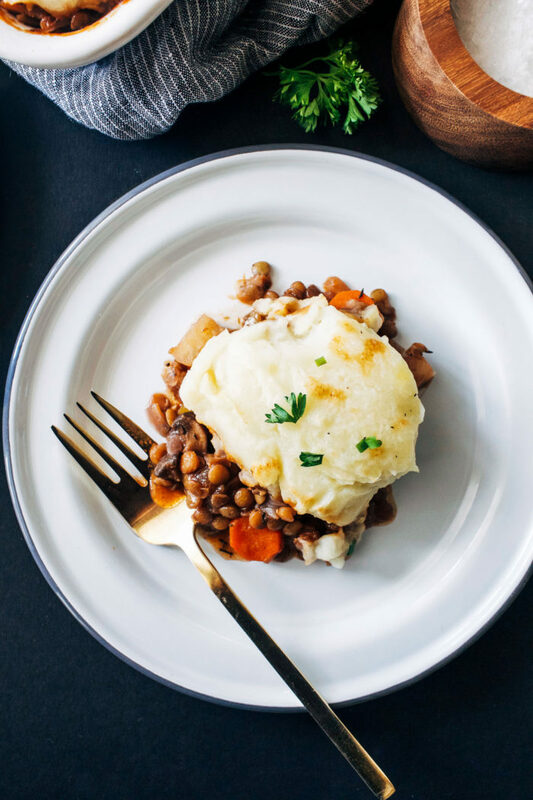 A plant-based take on the comforting classic made with hearty lentils and parsnip mashed potatoes. So delicious that even meat eaters will love it! In a large pot over medium high heat, cover the potatoes and parsnips with water by a few inches. Bring to a boil and allow to cook for 30-35 minutes, until they are tender enough to be mashed. Meanwhile, start the filling by warming the olive oil in a dutch oven over medium heat. Add the onion, sprinkle with salt and cook for a few minutes, until translucent. Add the garlic, carrots, mushrooms, celeriac and seasonings (thyme and oregano) then cook for about 5 minutes, until the mushrooms start to release their liquid. Pour in the red wine, tomato paste, and Worcestershire then bring to a low boil. Allow to cook for about 5 minutes. Next add the rinsed lentils along with the vegetable broth. 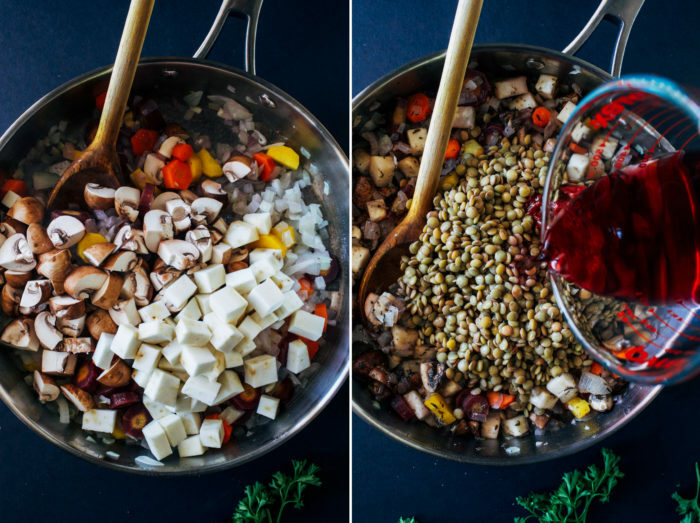 Simmer on low, cover and cook for 30-35 minutes, until lentils are tender. Preheat the oven to 400°F. Drain the water from the potatoes and parsnips. Using a potato masher or fork, mash the potatoes and parsnips together. Add the vegan butter, milk, garlic powder, and salt & pepper to taste. Add more milk or butter, if desired for a smoother texture. 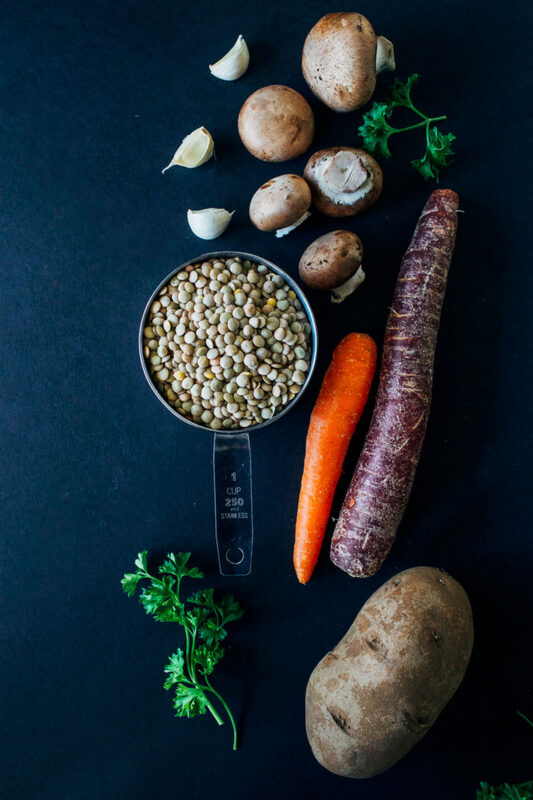 Lightly grease a pie dish or 8-inch square casserole dish then fill the bottom with the lentil mixture. Top with a layer of parsnip mashed potatoes, spreading them evenly so that they cover the lentils. Cook in the oven for 20-30 minutes, until the potatoes are a light golden color. Allow to cool for five to ten minutes then sprinkle with chives and pepper. Serve warm and enjoy! If you can't find celeriac feel free to substitute 3 stalks celery (finely chopped). 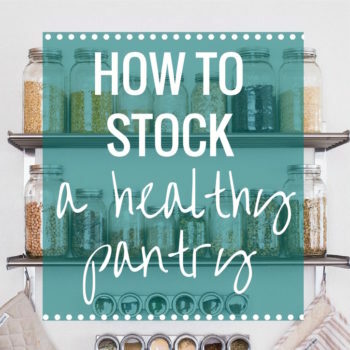 If you can't find parsnips or don't like them feel free to substitute an extra potato instead. You may need to add a splash of milk to help mash them. Holy yum! 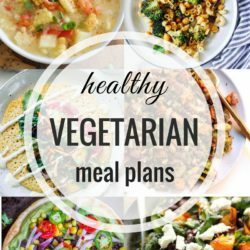 I’ve been thinking about making a vegetarian shepherds pie and this confirms it! It looks delicious!! I read your first sentence and immediately started nodding my head and said, “yes please! 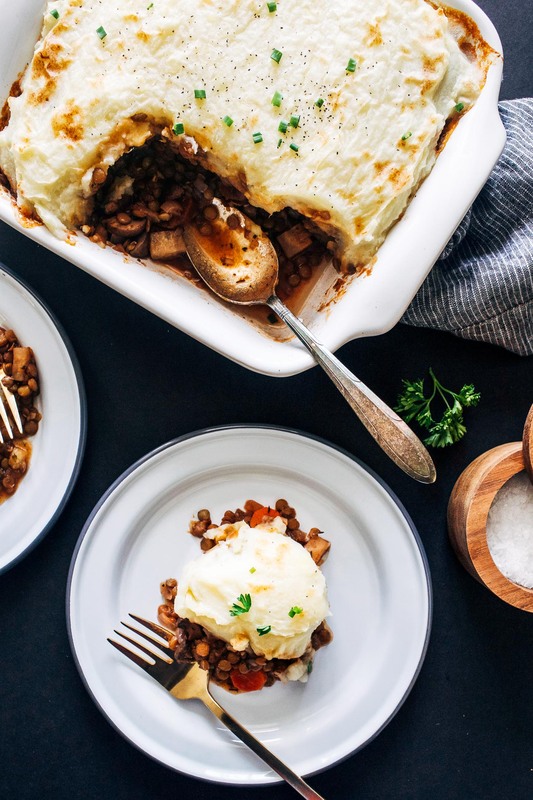 !” I LOVE vegetarian shepherd’s pies, adore parsnips and celery root, so I’m thinking this is what’s going to be on the table for St. Paddy’s Day! This is my kind of St. Patrick’s Day food. I love that it has both celery root and parsnips in it! I need to get my fill of winter veggies before the weather really heats up. Can’t believe you were up til 3:00 the other night – I got a reasonable amount of sleep, and this morning is still brutal. Hope you get to catch up in the next few days! 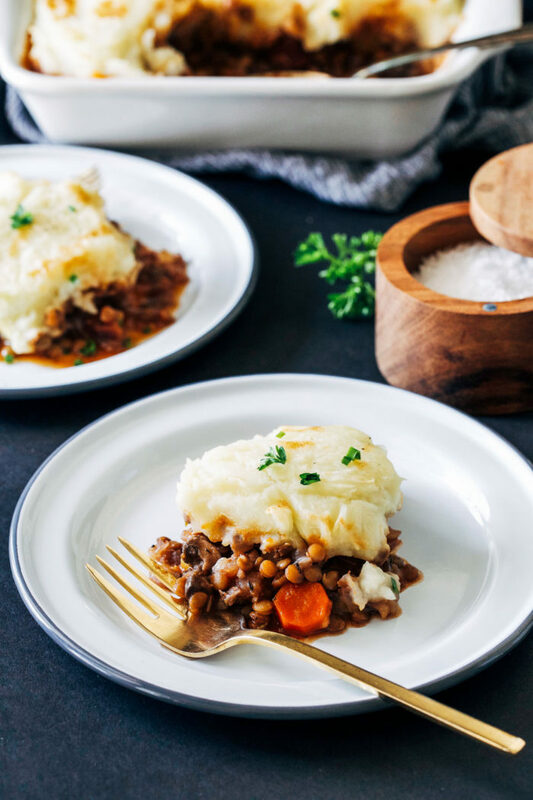 Whenever my mom would end up with leftover mashed potatoes, she would always make Shepherd’s Pie – such a childhood throwback for me! 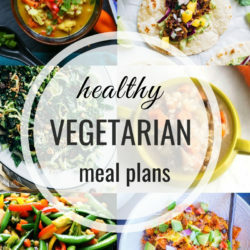 I love the idea of making a vegan version, it looks so good! Love everything about this dish! Can’t wait to make it myself. This looks incredible! I’ve been tinkering with the idea of a lentil shepherd’s pie, too! Great mind think alike. :) It’s such classic from my childhood. I love your idea of mixing the potato with parsnips. I can almost taste them just by looking. Have a great week and try to catch up on that hour! Grant made me vegan Sheppard’s pie for Valentines Day and it actually turned out pretty darn good. He used Angela’s recipe from OSG and surprisingly he didn’t ask for my help once. Your recipe (of course) looks amazing. Love the addition of parsnips to the potatoes.. clever! Oh man I could also definitely use some comfort food right now! I’m like all thrown off by the daylight savings change this weekend – I couldn’t fall asleep last night and am in such a fog today! This looks awesome lady! I’ve never used celery root before, but I bet it’s pretty tasty! The time change doesn’t usually throw me off that much, but that 4:30 AM wake-up call to hit the gym this morning was not fun. Made me feel like I work out in the middle of the night! I absolutely adore that mashed potato and parsnip topping! Love that it’s so rich and creamy with no cream or butter :) Fab. 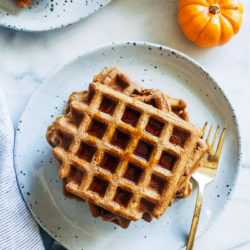 I am in the process of making this right now and can’t wait to try it! Just one note, the instructions do not include when to add the tomato paste and worchester sauce. I added them to the final stewing but just thought I’d give everyone a heads up! You could easily overlook the ingredients. Enjoy! Sorry Lois! I added it with the veg broth and wine but completely forgot to type that in the instructions. Thanks for the heads up and I hope you like it! I’m just going to pretend you made this meal exclusivly for me!! I love all the comforty goodness going on here. Parsnips and celery root are a great combo. This is meal is getting two huge thumbs up from me!!! Comfort food just the way I like it. 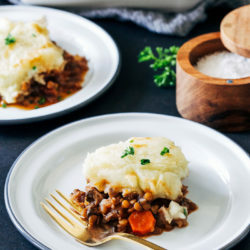 Growing up I never ate the traditional meaty Shepherd’s Pie so the first one I tried was actually vegan, too. Yours sounds especially good because it includes lentils and parsnips. I’ve posted a kidney bean pie with a mashed parsnip topping a while ago but your recipe is really intriguing so I might have to give it a go sometime. Pinned and hopefully not forgotten :) . Yeah this is great and everything, but if you’re vegan, or even vegetarian, what are you doing using Worcestershire sauce? Don’t you know it has anchovies in it? Hmmmmm maybe you should revise that part. Really delicious! I didn’t have celery root so I substituted turnips. Also had tri-color carrots so used one each of the orange, yellow, and purple carrots. So yummy! The lentils helped to make a really tasty gravy. Thanks for the great recipe! 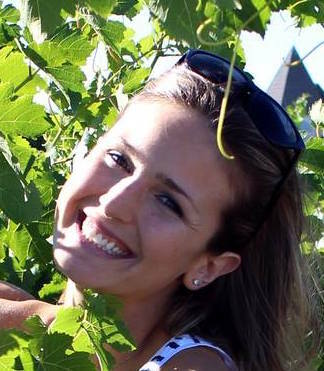 Hi Sara, I used a vegan Worcestershire for the recipe called Annie’s Naturals. You’re actually the second person to comment on that so I went ahead and updated the ingredients. Sorry for the confusion! 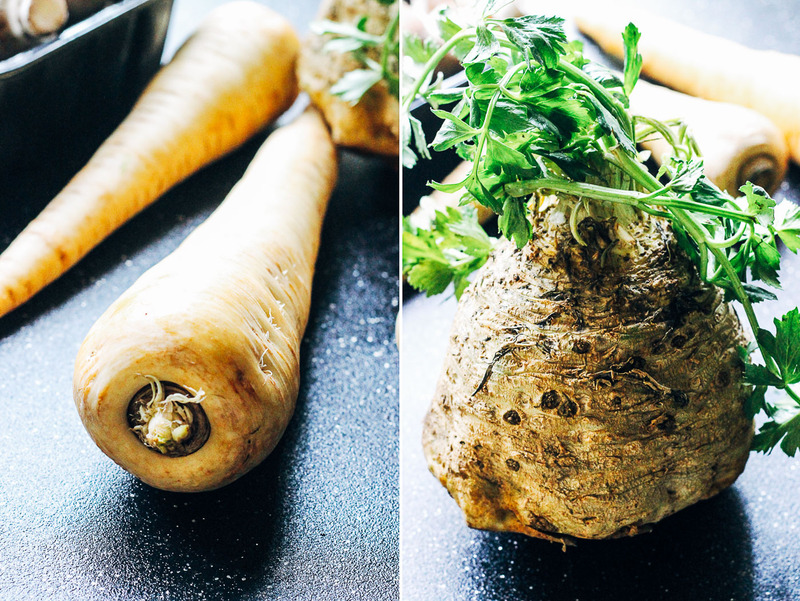 What can you use if you don’t have access to celery root? Hi Jim! You can use more parsnips in it’s place or leave it out. I hope that helps! This looks amazing! so cozy delicious! I had celeriac mash on a cruise and I could NOT tell the difference! Actually I asked the server what kind of potatoes were used in the mashed potatoes I ordered because I liked them even more than any I have made (and my fam says I make a mean mashed potato) When he told me it was celeriac. …I couldn’t believe it! 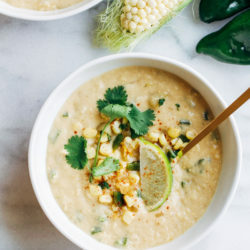 So creamy & flavorful! I rarely use potatoes anymore! 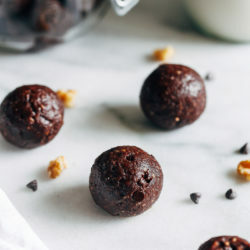 Such a delicious classic, Sarah and I absolutely love your vegan version! Way to go you on that celerac too! I got cozy with that root veggie this winter. It makes pretty fabulous soup! Looks so good! I haven’t made a Shepards Pie in awhile. So far in my pregnancy I’ve been craving potatoes, so I’ve been making homemade chips and fries, mashed potatoes, etc. and might need to make this soon!